Graphics Primitives are non-interactive rudimentary elements displayed on a screen. Several primitive elements can be combined together to create a complex image. Graphics primitive elements are used by both Microchip Harmony and MLA applications. Lines, Circles, Arcs, Rectangles, etc. 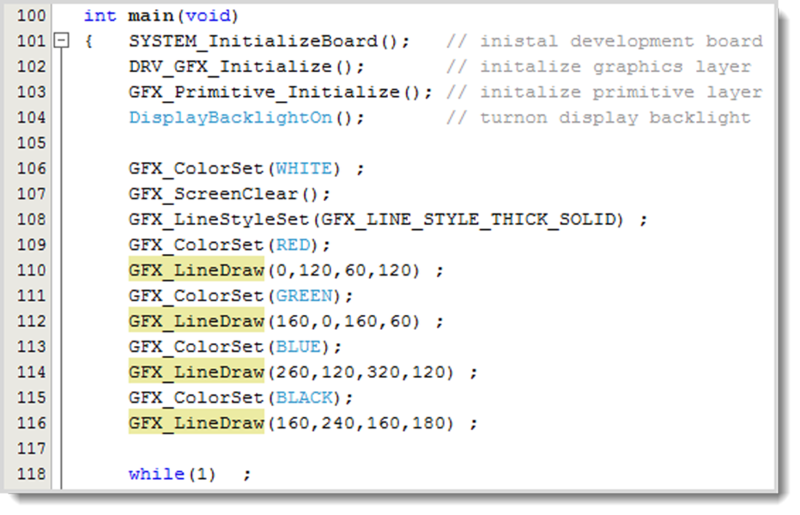 In order to include Graphics Primitives in a project both gfx_primitive.h and gfx_primitive.c files must be included in the project. Care should be taken regarding the use of Graphics Primitives in an application. Graphics primitives are easy to understand and program. New-to-graphics designers tend to over use graphics primitives in displaying dynamic data. Primitives are primarily used in introduction or "splash" screens. Graphics Objects are best used to display dynamic data and retrieve user input from touch screens. DRVgfx_Initialize() - Initializes the display driver. This function must be called before any graphics element can be displayed. 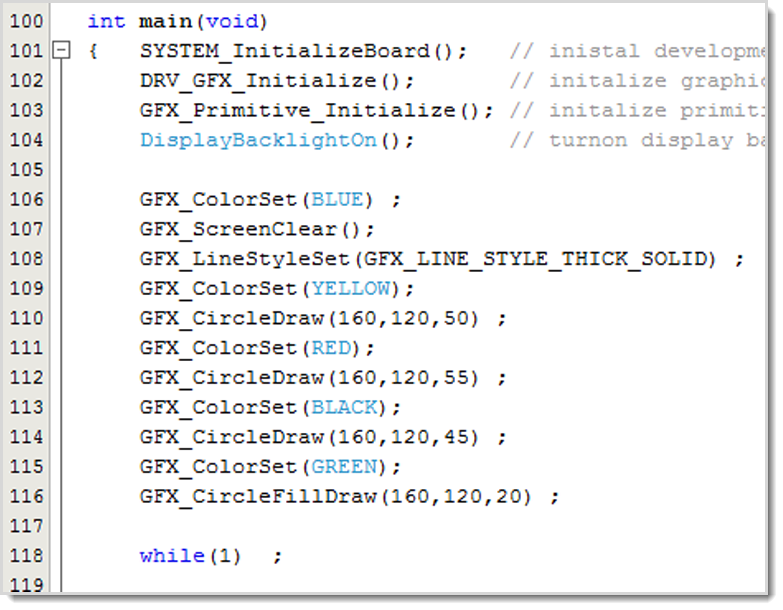 GFX_Primitive_Initialize() - Initializes the primitive layer software allowing the primitive's drawing functions to operate. GFX_ColorSet(color) - Sets the drawing color. 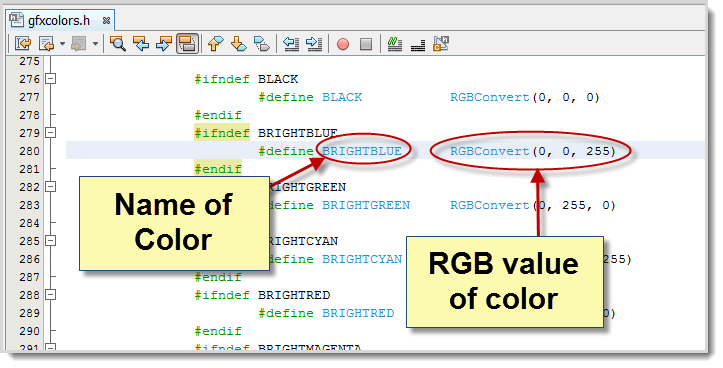 The value of the color is set by the RGB565 macro and can be found in GFXColor.h. GFX_ScreenClear() - Clears screen with current color then places the cursor at (0,0). GFX_LineDraw(unit16 x1, unit16 y1, unit16 x2, unit16 y2) draws a line from x1,y1 to x2,y2, and leaves the cursor at the end point of the line. GFX_RectangleDraw(unit16_t Left, unit16_t Top, unit16_t Right, unit16_t Bottom) draws a rectangle using the current line type, and co-ordinates for top, left, right and bottom. 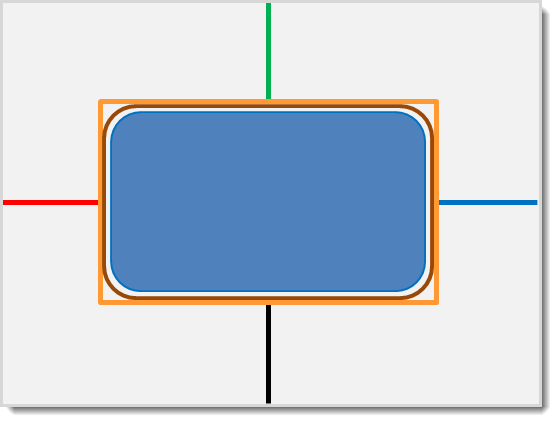 GFX_RectangleRoundDraw(top, left, bottom, right, radius) renders a rectangular shape with rounded corner using the given left, top, right, bottom and radius parameters to define the shape dimension. Radius defines the rounded corner shape. When = x2 and y1 = y2, a circular object is drawn. When x1 < x2 and y1 < y2 and rad (radius) = 0, a rectangular object is drawn. 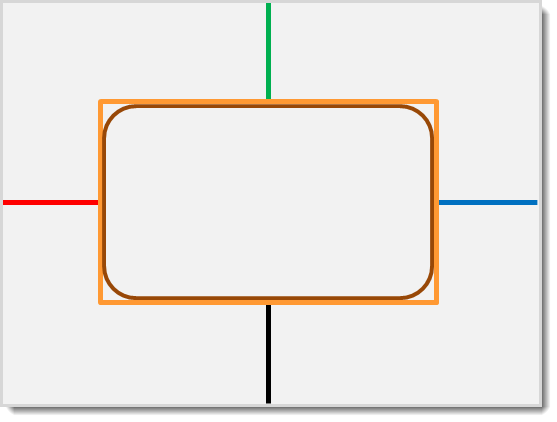 GFX_RectangleRoundFillDraw(top, left, bottom, right, radius) draws a filled beveled figure on the screen. 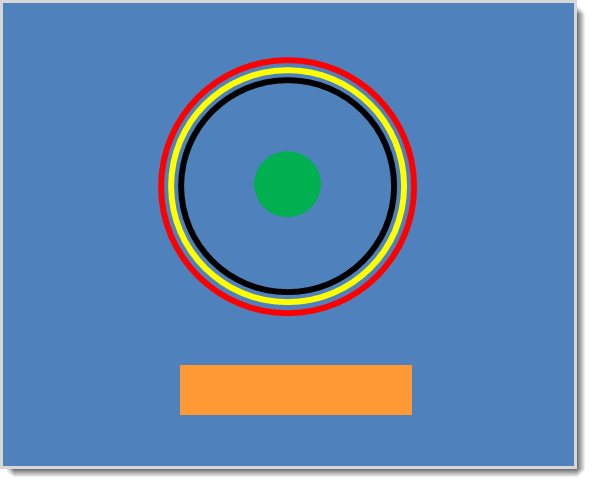 For a filled circular object use top = bottom, and left =right. For a filled rectangular object, use radius = 0. GFX_CircleDraw(x,y,radius) draws a circle with the given radius and center point using the current line type. 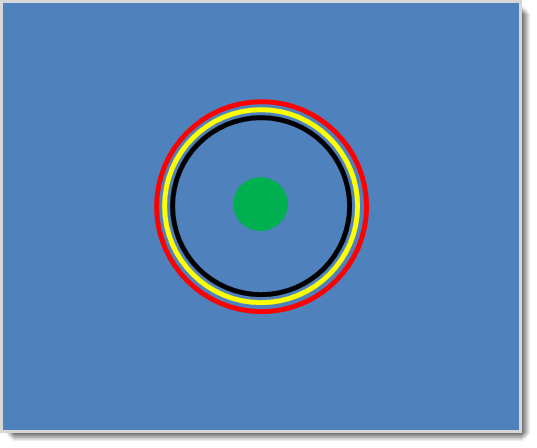 GFX_CircleFillDraw(x,y,radius) draws a circle filled with the current color. 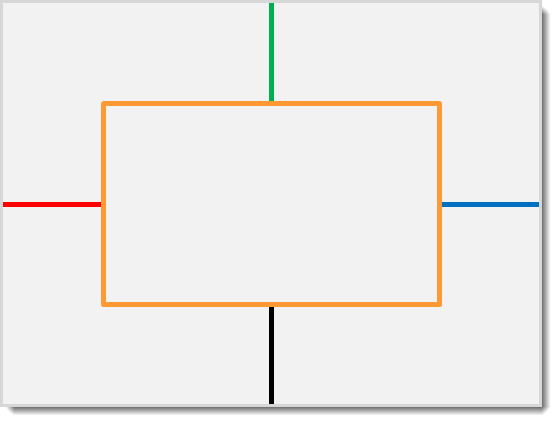 RectangleFillDraw(left,top,right,bottom) draws a solid rectangle using the current color within the coordinates.